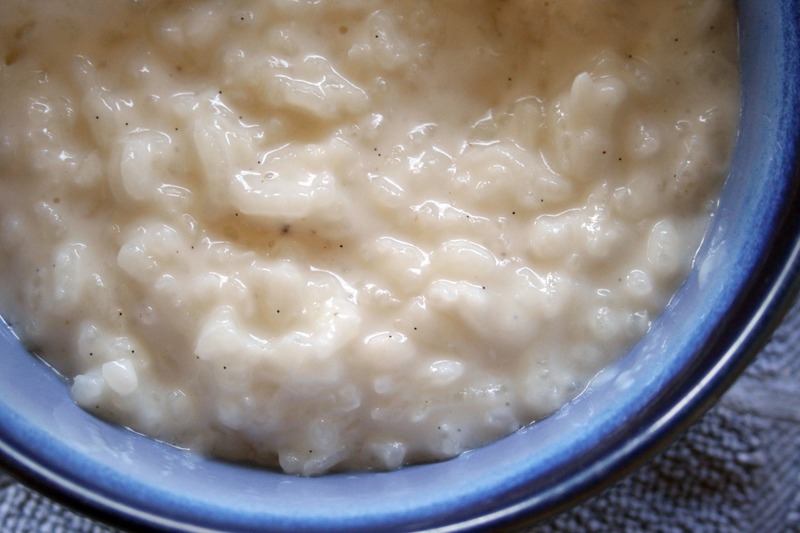 I’m trying something a little crazy…my go to arroz con leche recipe has plain ‘ol milk in it. This is my first time using coconut milk and it’s my first time knowingly trying any food with this in it. Hopefully it’s not a complete waste of ingredients and time…I love rice pudding and it’s something that reminds me of my childhood. My Gram made her version (my fave no matter what) often and my siblings and I ate it hot as a breakfast treat. I’m sure I’ll never be able to recreate hers, but in the meantime, I’m having fun tasting other versions. This need for rice pudding came when I realized that I have several Madagascar vanilla beans patiently waiting to be used in my pantry. I bought them over the summer and haven’t used a single bean! How dare I! 😉 It has been at least a full year since the last time I made this decadent treat, so why not put the two together? While searching through Tastespotting, I found several versions of the classic – some with coconut milk and some with vanilla bean seeds. This recipe is a mishmash of a few recipes and techniques that will hopefully come together beautifully! Verdict: So good, I love this stuff! Creamy, slightly sweet and perfectly comforting in my book. I didn’t notice the coconut flavor, but it wasn’t as thick or “butter fatty” as the other recipe. I only used one cup because coconut milk has such a high fat content, so I’ll be on the look out for lighter coconut milk. Also, I was also able to make a bigger batch of vanilla sugar the day I made this, so hopefully I can find the perfect use for some of it. Thanks for reading, enjoy! Pour rice and water into a 4 quart dutch oven or larger. Add the lemon peel, cinnamon stick and vanilla seeds to the pot. Let sit for an hour. Add the milk and stir well to mix, add the sugar and cook over medium-low heat, stirring carefully, until it thickens slightly or until desired consistency, about 25 to 35 minutes. 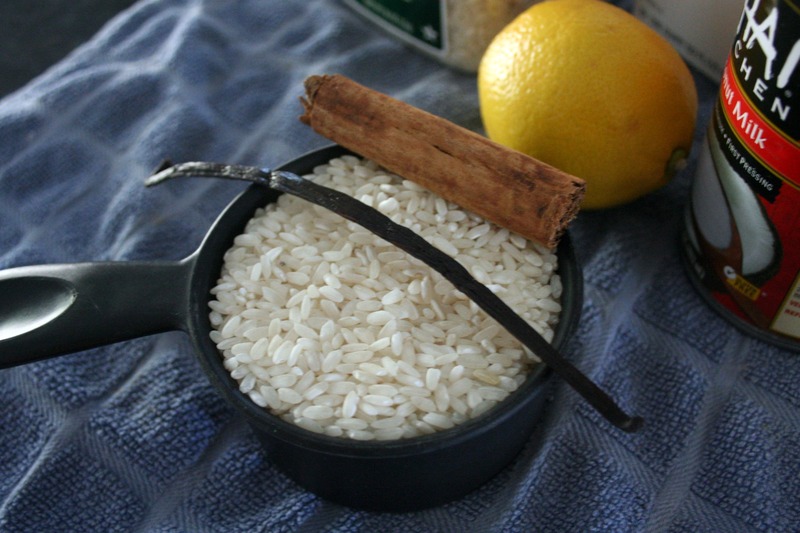 Remove the lemon zest and cinnamon sticks. Serve hot, cold or room temperature. These taste better than they look. If you love thin, crispy cookies like I do then you’ll enjoy these. I was looking for a sugar cookie recipe that I could add M&Ms too for my daughter’s birthday snack for her preschool class. I was disappointed by how these turned out because I envisioned a puffier cookie. These cookies spread a lot and I just used my small 1 tablespoon cookie scoop to dish these out. Don’t skip the chill in the fridge for these or they’ll spread even more, but the longer the dough sat in the fridge the less they spread. Next time I will find a basic chocolate chip cookie recipe and add the M&Ms in place of the chips. In the end, the kids didn’t mind, and neither did my chewy-cookie-loving-husband;) Thanks for reading, enjoy! 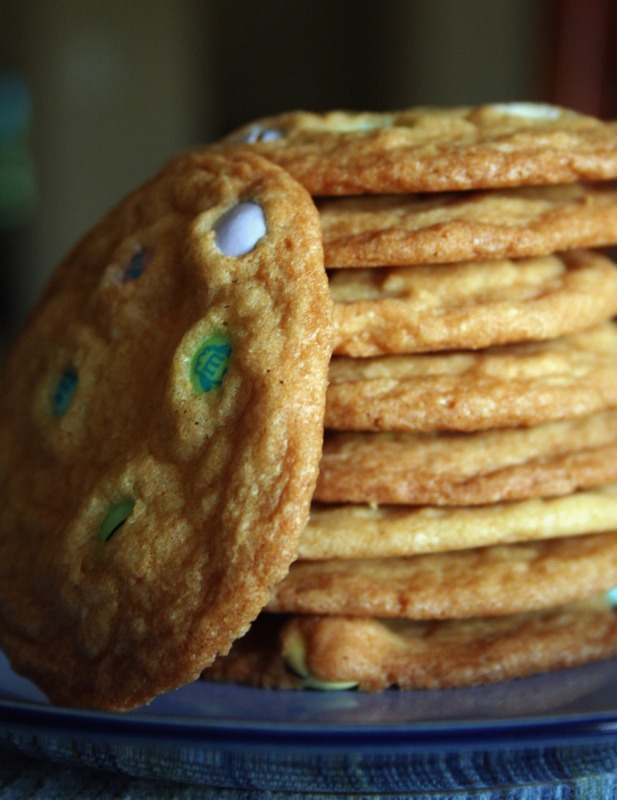 M&M Cookies – adapted from What’s Gaby Cooking? 1. Cream together the butter and sugars in a mixer. Add the eggs and vanilla, making sure to scrape down the sides of the mixing bowl. Add the flour, salt, baking soda and baking powder and mix on low until everything is incorporated. Chill the dough for two hours. 2. Preheat your oven to 350 degrees. Scoop the cookie dough onto a Silpat or parchment-lined baking sheet. Be sure to leave plenty of room around each ball, about 8 cookies per pan. Bake for 10-12 minutes or until desired doneness. Remove from oven and let rest on the baking sheet. Once they’re firm enough, move them to a cooling rack. Makes about 48 cookies. This week my parents came to visit, so I pulled out all the stops! But this wasn’t just to create a more memorable visit, it was mostly to celebrate our little girl’s fifth birthday. We forgot to pick up candles and I meant to put rainbow sprinkles on this, but she assured me that it was “okay”. 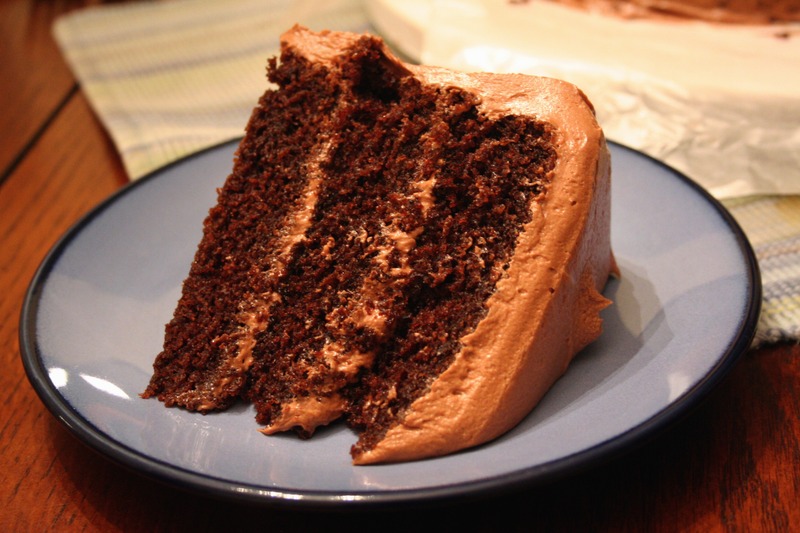 Thankfully the lack of these items didn’t take away from the flavor and richness of this cake. This was my first ever homemade icing and it was so easy, thanks to my trusty KitchenAid standing mixer. It is a messy process sifting all those six cups of powdered sugar, but it was worth it. Next time I will be more generous with the frosting between the layers, but I was worried I wouldn’t have enough to frost the “outside”. 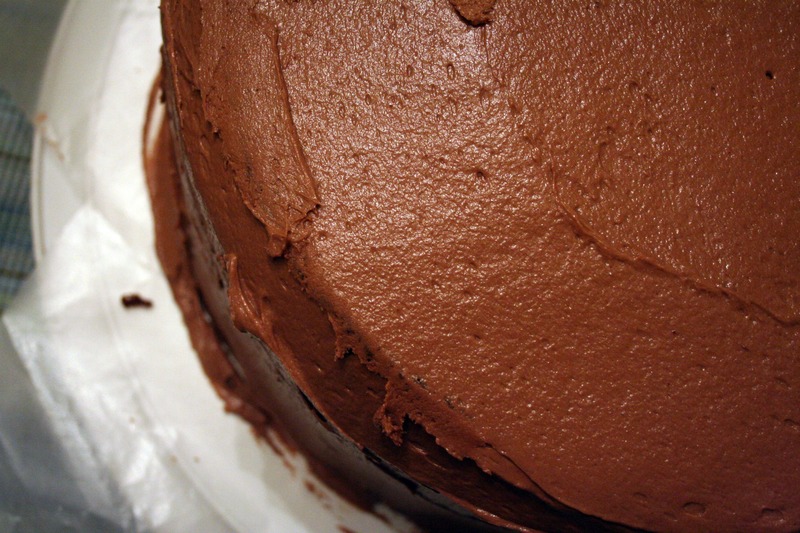 Once the cake was frosted, I put it in the fridge to set up. Oh, and don’t mind the wax paper – that was meant to keep the cake plate cleaner but I forgot to remove them before the rest in the fridge. 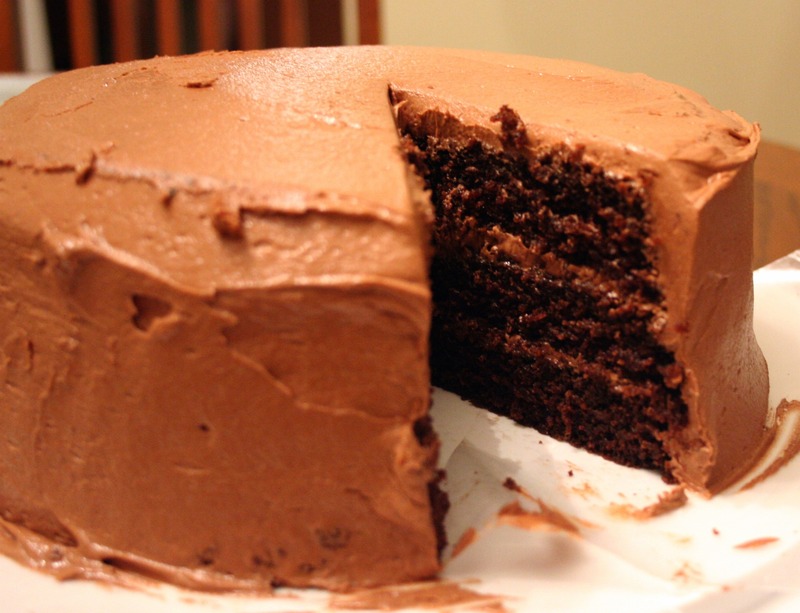 Overall, this cake was really worth the effort and not at all difficult. Thanks for reading, enjoy! 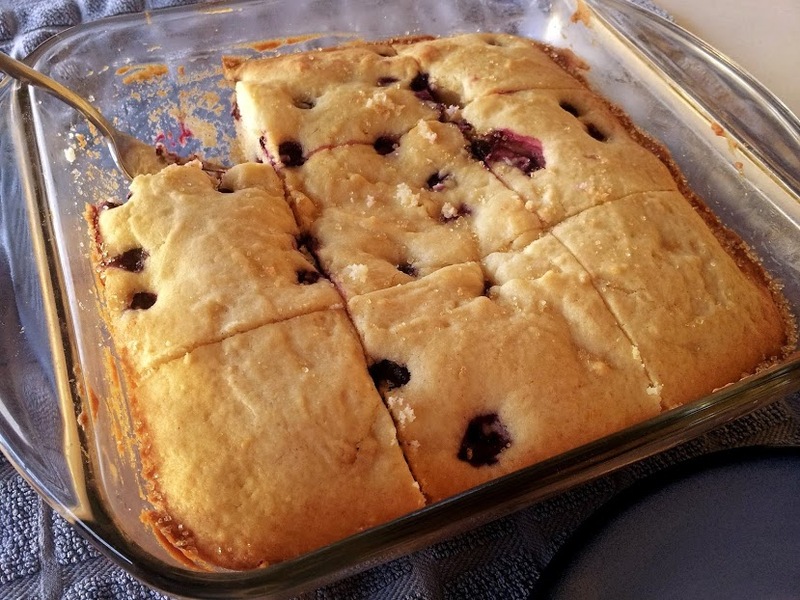 Quick Post: This has to be the easiest, least-fancy dessert I have ever made. I’m not usually one to make something this unhealthy, but it’s one of M’s favorites. Don’t judge it’s outward appearance! I know chocolate would make all the difference, but this pie is decadent enough without it in my humble opinion. I know M would disagree, as he likes things so sweet it makes my teeth hurt! Also, he just really loves chocolate. If you decide to make this, make sure it sits in the fridge for at least four hours, but overnight would be even better. The last time I made this we didn’t wait too long – it tasted ok, but the day after it was so much better. Thanks for reading, enjoy! Note to self: impatience is NEVER rewarded. I learned this the hard way. I’ve made this bread twice this week (and plan on making it again next week – hopefully with better results). The first time was fine because I didn’t bother getting the loaf out of the pan while it was still hot and just cut the pieces out of the pan. There is a short window of opportunity to get loaves out of their pans before they stick, so I wanted to work on it within seven minutes of taking it out of the oven. That obviously didn’t help either. This loaf sticks like crazy, so now with two failed attempts at de-panning, I know now that I need to butter the pan and then put a piece of parchment paper on top of that. Next week we’ll see if that works! It better because this is not something I want to happen again. 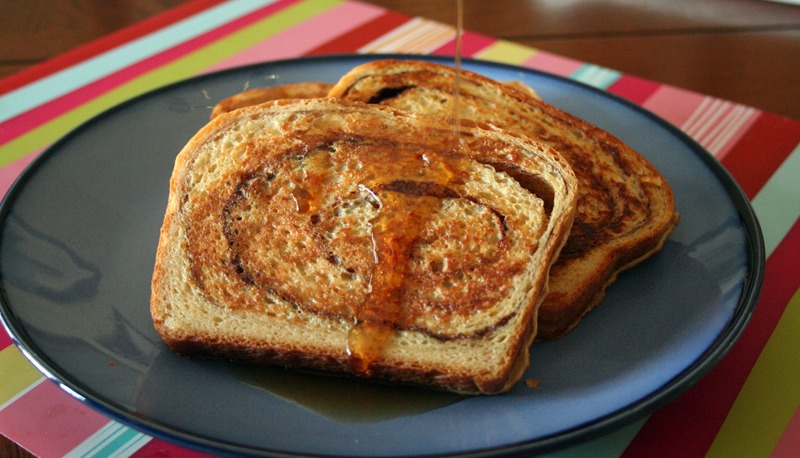 A few days ago, I decided that I would make French toast; and today I thought: “why not make that cinnamon swirl bread I bookmarked so long ago?” Sure, it takes a little more effort but my family is worth it! 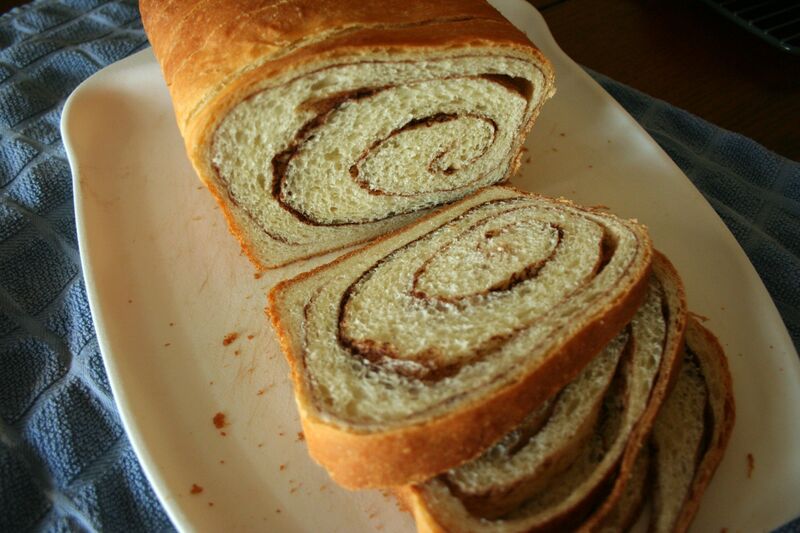 This recipe is actually a raisin/cinnamon swirl bread – but M doesn’t like raisins so, I left them out. The recipe was simple enough to follow, but not as straight forward as my favorite sandwich bread recipe. The dough is super soft and kind of sticky once it’s all finished kneading – but don’t worry! After its first rise and quick chill in the freezer, it was much easier to work with. Rolling it out was simple enough because it didn’t snap back like other doughs. Next time I will roll the dough out slightly smaller so I don’t have so much to tuck underneath. That explains the wonky look of my loaf. It’s not going to win any perfect loaf contest, but I’m sure the family won’t mind. For the custard, I used this recipe but with slightly less sugar. The sweetness in the dough should be plenty to make up for that. Put the yeast in a small bowl, toss in the pinch of sugar and stir in 1/4 cup of the warm milk. Let rest for 3 minutes, then stir – the yeast may not have dissolved completely and it may not have bubbled, but it should be soft. Working with a stand mixer, preferably fitted with a paddle attachment, combine the remaining 1 cup of milk, the butter and the remaining 1/4 cup sugar and mix for a minute or two. Add the salt, egg and vanilla, if you are using it, as well as the zest and nutmeg, if you’re using them, and mix for a minute. In all likelihood, the mixture will look unpleasantly curdly (it will look even worse when you add the yeast). Add the yeast mixture and beat on low-medium speed for 1 minute more. Turn the mixer off and add 2 3/4 cups of the flour. Mix on low speed just until you work the flour into the liquids – you’ll have a sticky mix. If you’ve got a dough hook, switch to it now. Add another 1 cup of flour, increase the mixer speed to medium and beat the dough for a couple of minutes. If the dough does not come together and almost clean the sides of the bowl, add up to 1/4 cup more flour, 1 tablespoon at a time. Keep the mixer speed at medium and knead the dough for about 3 minutes, or until it is smooth and has a lovely buttery sheen. The dough will be very soft, much too soft to knead by hand. Butter a large bowl, turn the dough into a bowl and cover the bowl tightly with plastic wrap. Put the bowl in a warm place and let the dough rise until it is doubled in size, about 1 1/2 hours. Scrape the dough onto a large piece of plastic wrap, wrap it and put it in the freezer for 30 minutes to firm enough to be rolled easily. 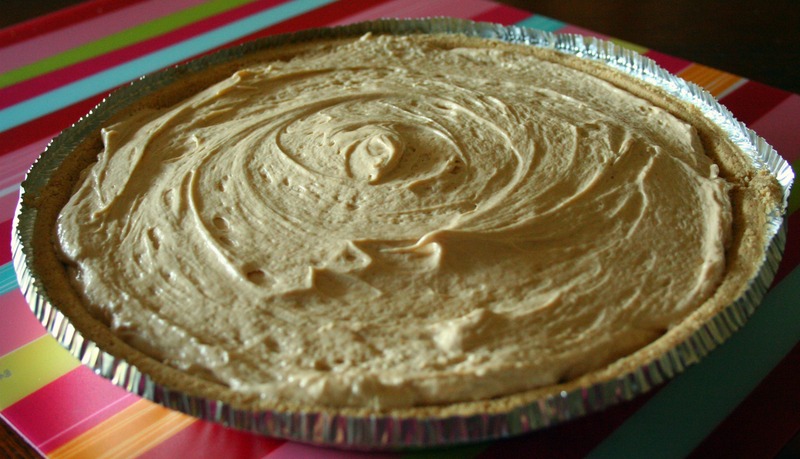 (At this point, you can instead refrigerate the dough overnight if that is more convenient). Butter a 9 x 5 inch loaf pan. Whisk together the sugar, cinnamon and cocoa, if you’re using it. Check that the raisins are nice and moist; if they’re not, steam them for a minute, then dry them well. Put the dough on a large work surface lightly dusted with flour, lightly dust the top of the dough and roll the dough into a rectangle about 12 x 18 inches. Gently smear 2 tablespoons of the butter over the surface of the dough – this is most easily done with your fingers. Sprinkle over the sugar mixture and scatter over the raisins. 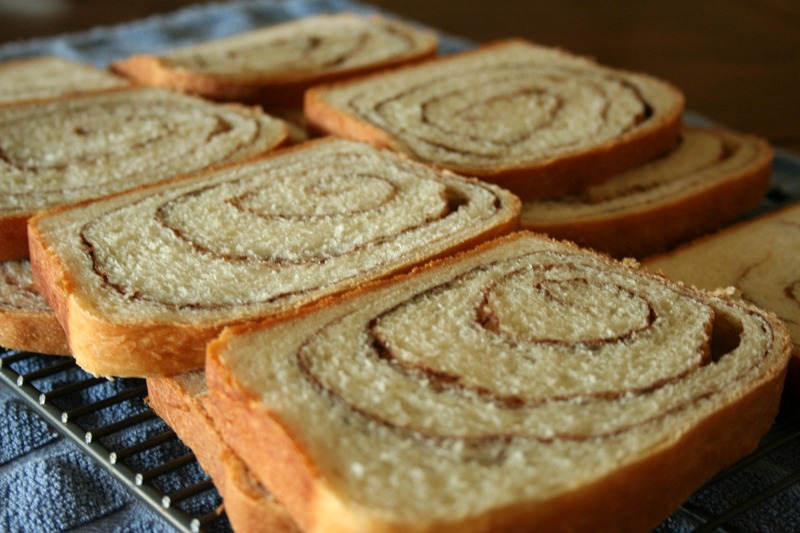 Starting from a short side of the dough, roll the dough up jelly-roll fashion, making sure to roll the dough snugly. Fit the dough into the buttered pan, seam side down, and tuck the ends under the loaf. Cover the pan loosely with wax paper and set in a warm place; let the dough rise until it comes just a little above the edges of the pan, about 45 minutes. When the dough has almost fully risen, centre a rack in the oven and preheat the oven to 375 degrees F (190 degrees Celsius). Line a baking sheet with parchment or a silicone mat. Melt the remaining tablespoon of butter, and brush the top of the loaf with the butter. Put the pan on the baking sheet and bake the bread for about 20 minutes. Cover loosely with a foil tent and bake for another 25 minutes or so, until the bread is golden and sounds hollow when the bottom of the pan is tapped. Transfer the pan to a rack and cool for 5 minutes, then unmold. Invert the bread and cool to room temperature right side up on the rack. M requested something “triple chocolate” the other day, so off to Tastespotting.com I went. 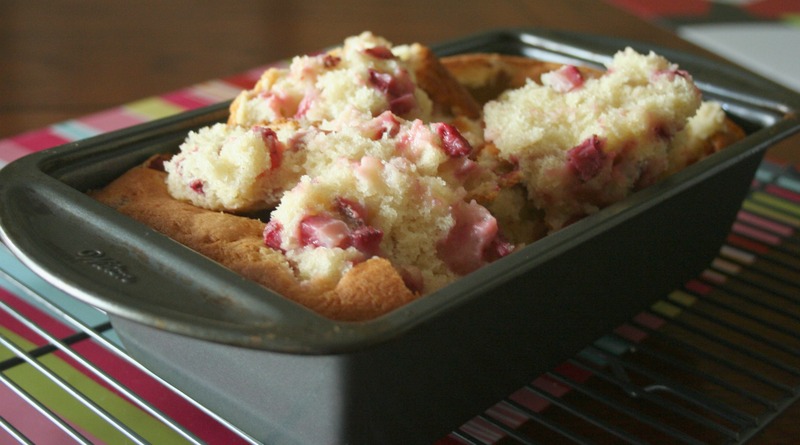 I meant to bake these up for Valentine’s Day, but I didn’t get around to it…oh, well! Today was a good day for cookies and these are rich, moist and fudgy. I don’t choose chewy cookies for myself (store-bought chewy cookies ruined them for me), but these have a pleasing soft and chewy texture. 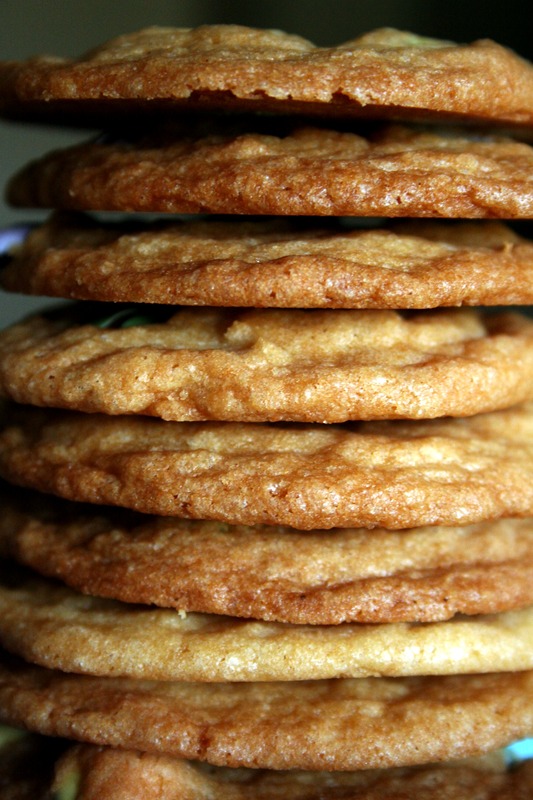 They do take more time, but not too much more effort than the average cookie recipe. Be sure to read ahead in these directions before making them – I didn’t know the dough needed to sit 30 minutes before I could dish them out. The cookies need to cool on the baking sheets for a full ten minutes before being transferred to a cooling rack, too. 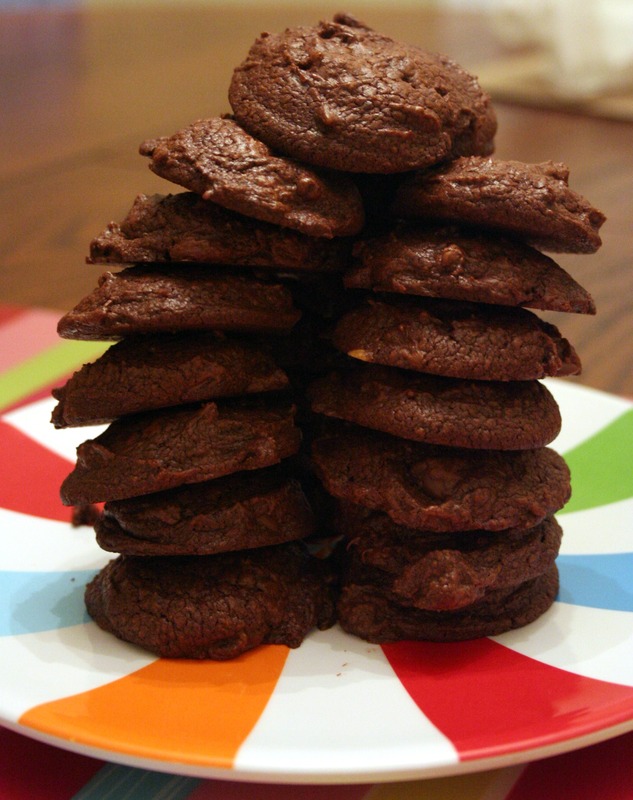 Make sure you have lots of chocolate on hand before deciding to make these. M wanted some cookies so bad, he was willing to make a quick trip to the store to pick up more chocolate. I needed almost a full two pounds! Thankfully this recipe makes nearly four dozen cookies, so you can spread the love around by passing these out to friends and family…better to do that than be tempted to eat them all! ;) Thanks for reading, enjoy! Combine the flour, cocoa powder, baking powder and salt in a medium bowl. Whisk together; set aside. Melt the chocolate in a heatproof bowl set over simmering water until completely melted and smooth; remove from the heat. (Alternatively, microwave the chocolate in 30 second intervals, mixing thoroughly in between, until melted and smooth.) In a small mixing bowl, combine the eggs, vanilla and instant coffee granules; stir well with a fork to dissolve; set aside. In the bowl of an electric mixer fitted with the paddle attachment, beat the butter at medium speed until smooth and creamy, about 5 seconds. Mix in the sugars until well combined, about 45 seconds – the mixture will look granular. Reduce the mixer speed to low and gradually beat in the egg mixture until incorporated, about 45 seconds. Add the chocolate to the bowl in a steady stream and continue beating until combined, about 40 seconds. Scrape the bottom and sides of the bowl with a rubber spatula. With the mixer at low speed, add the dry ingredients and mix just until incorporated, being careful not to overbeat. Fold in the chocolate chips with a rubber spatula. Cover the bowl with plastic wrap and let stand at room temperature until the consistency is scoopable and fudge-like, about 30 minutes. Meanwhile, preheat the oven to 350° F. Line 2 baking sheets with parchment paper. Scoop the dough onto the prepared baking sheets with a 1 ¾-inch cookie dough scoop, spacing the dough balls about 1 ½ inches apart. Bake until the edges of the cookies have just began to set but the centers are still very soft, about 10 minutes, rotating the sheets halfway through baking. Cool the cookies on the sheets about 10 minutes, transfer to cooling racks and allow to cool completely. Cool the baking sheets before baking more batches with the remaining dough.